WATERLOO – Following the Wilfrid Laurier University Faculty of Music’s successful 40th anniversary season, the faculty will present its 2016-2017 concert schedule, which will kickoff with a free concert Sept. 15 at noon in the Maureen Forrester Recital Hall on Laurier’s Waterloo campus. As in previous years, Laurier students, faculty, alumni and guest artists will make their way to the stage to share their talents with the community. 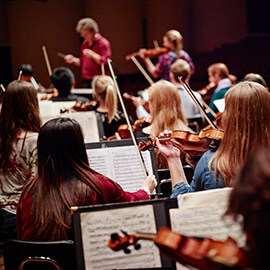 Laurier’s wind and symphony orchestras, student composers, choral choirs and small ensembles will introduce concertgoers to the best of young Canadian performers and composers. The Music at Noon series will feature local and national artists every Thursday free of charge. The 2016-17 season will celebrate the Penderecki String Quartet’s (PSQ) 30th anniversary and its 25th year as Quartet-in-Residence at Laurier. To commemorate these landmarks, the PSQ will present a gala concert on March 19. Besides masterworks of the quartet literature, the concert will feature acclaimed Canadian pianist Janina Fialkowska performing Chopin’s E minor Concerto. This performance will mark Fialkowska’s first appearance at Laurier since she received her honorary doctorate in 2013. The concert series will welcome guest artists including the Manitoba Chamber Orchestra and famed percussionist Dame Evelyn Glennie with conductor Anne Mason, performing together on Oct. 6. Canada’s “tiny, perfect chamber orchestra” will join forces with Glennie, the recipient of the 2015 Polar Music Prize, for an inspirational and powerful performance.